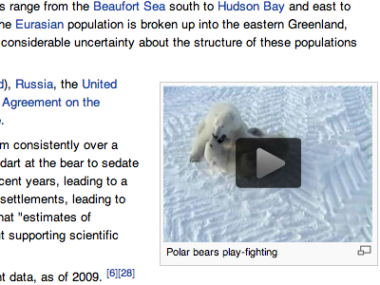 As of today, Wikipedia is open to HTML5 video uploads. The video project is a collaboration with video start-up Kaltura and Google, and it’s actually been in the works since 2008, but was delayed by infrastructure upgrades, personnel changes and other problems over the past four years. “Wikipedia has more than half a billion unique monthly visitors, so any new feature that is deployed needs to be really sustainable and fool-proof,” said Kaltura president Michal Tsur. Today, there are only about 15,000 videos on Wikipedia, a mishmash of beta testing and uploads in an older and more limited format called Ogg Theora. You can see an example of a Kaltura video on the page about polar bears. But don’t expect to see videos on every Wikipedia page anytime soon. For one thing, sharing videos with the new Kaltura player won’t be as simple as embedding a YouTube video on a relevant page; users will have to upload content directly to Wikimedia Commons. And there aren’t the same sort of reserves of accessible video content as there are for photos, though there is freely licensed content on YouTube in the now-compatible WebM format, as well as on the Internet Archive. Once videos are uploaded, people will be able to add captions, translations, and more. But some planned features, like mobile format support and full video editing, aren’t available yet.